If There’s One Video You Should See Today, It’s Definitely This One Right Here! It is snowing in a lot of places at this time of the year. In fact, some of you may already be experiencing blizzards and the like – not exactly fun stuff! Especially when the snow has to be moved aside, lest they cut off access to the world outside and other necessities like power. That said, you can still have some fun – especially with your pups! 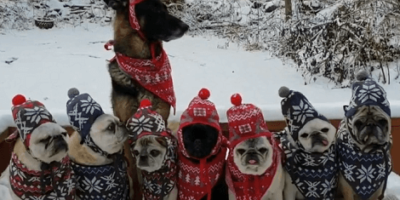 On a snow day such as this one, a German Shepherd and his seven Pug siblings are all dressed up in adorable hats and ponchos for a family photo! Except… it isn’t actually a photo. It is secretly a video – but shh! Don’t let these pups know, or they will stop posing. For now, just enjoy how adorable they look all sitting pretty in a row in the middle of all this fresh snow! What a lovely sight to see, and one that certainly warms the heart! This Pup’s Talent At Playing Soccer Is Definitely Going To Drop Your Jaw! While Most Of Us Gather Indoors When It Snows, This Adorable Pup Goes Outdoors To Enjoy It!